Jan Worst (born 1953 in Heerenveen, The Netherlands) lives and works in Groningen, The Netherlands where he graduated from the Academie Minerva in 1976. 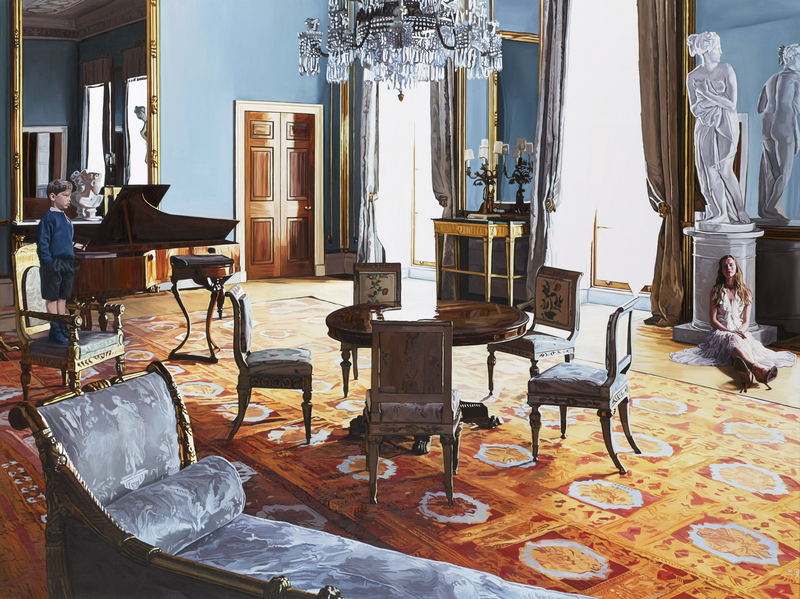 Rich interiors of bourgeois palaces and residences, decorated with precious carpets and tapestries become enveloping environments that include the observer in the artwork, but at the same time disorient and confuse them because the artist usually places in the setting something from our contemporary world clashing with the traditional approach of the work. Recent solo exhibitions include Interiors, Ben Brown Fine Arts, Hong Kong, 2017; Paintings, Bergarde Galleries, Heerjansdam, 2013; Illuminations, Ben Brown Fine Arts, London, 2010; Sperone Westwater, New York, 2004; Torch Gallery, Amsterdam, 2002; gian Enzo Sperone, Rome, 2002; Kunstverein Hochrhein e.V., Bad Sackingen, 2001; Galleria Cardi, Milan, 2000. Jan Worst has displayed work institutional venues including The Hidden Picture, 40 jaar kunstverzamelen bij ING, Cobra Museum Amsterdam, 2014; Scherp Kijken, Museum More, Gorssel, 2014; The Magic of Dutch Realism, The Pushkin State Museum of Fine Arts, Moscow, 2013; Face 2 Face, Portraits and Interiors, Chinese-Dutch painting Exhibition, He Xiangning Art Museum, Shenzhen, 2013; Face 2 Face, Portraits and Interiors, Chinese-Dutch painting Exhibition, Today Art Museum, Beijing, 2013; The Adventure of Reality: International Realism, Kunsthal Rotterdam, Rotterdam, 2010; Recente aanwinsten, Scheringa Museum voor Realisme, Spanbroek, 2008; Leve de Schilderkunst! Terug naar de figuur/ Painting Now! Back to Figuration, Kunsthal Rotterdam, Rotterdam, 2007; Rockers Island, Olbricht Collection, Museum Folkwang, Essen, 2007; De Magie van het Realisme, Het Gorcums Museum, Gorinchem, 2006; Der Rote Teppich, Kunstverein KISS, Abtsgemund-Untergroningen, 2005; Centrum Beeldende Kunst, Groningen, 2004; Collectie van de Gasunie, Museum de Buitenplaats, Eelde, 2004; Between Earth and Heaven, Museum voor Moderne Kunst, Oostende, 2001.